Torrential rains across Edo State have resulted in flooding that rendered hundreds homeless in 35 communities in Edo Central and Edo North. Most of the affected communities are those in the bank of River Niger. After warnings of impending flood by relevant bodies, the state government urged people living in riverine communities to move upland and take refuge in safe havens that have been created in local government areas of the state. Apparently, many of the residents did not heed this warning because of traditional and cultural beliefs even as many insisted that they could not leave their ancestral homes. But floods are now forcing them to leave their homes for safety. In Edo Central, particularly Esan South-East local government area, floods wrought untold destruction in four of the ten wards particularly in Illushi Ifeku Islands and environs. 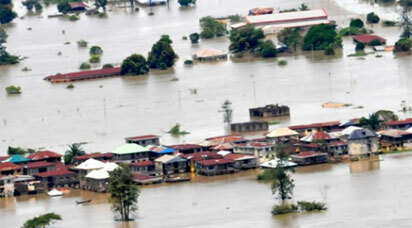 Also affected are Illushi Oji, Oji Ozigono, Oji Awenje, Ajobe, Ajabutu, Owoli, Iyegbi and Ukpodo. Others hit are Iyenlen, Okpuru, Odugume I and II, Okpokporo, Igbanaka, Oditor, Okpein, Atorino, Enenia and Odo – Egume Ogwu, Odo-Egume Ubi, Odi-Ojele, Odo-Ogor, Odi-Utor, Utor Waterside, Utoh Inland, Okpemi Swamp, Okpuiru, Ebale Lakeside, Okee Rice Farm, Akaba Confluence Area, Okwoshimili, Alla, Atowor, Adagu Efoja and Okpatawo, Ikpejomuna Island communities. No fewer than 8,000 households are affected and thousands of hectares of farmland washed off. The Council Chairman, Mr Victor Emuankhagbon, while lamenting the destruction, called for urgent assistance for victims. He said the enormity of the destruction had put rescue efforts beyond the council and called for state and federal governments’ intervention. In Edo North, the disaster affected communities in Etsako East and Etsako Central local government areas. Mostly affected are Udaba, Anegbette, Usomegbe, Uduchi among others. The traditional ruler of the Oliola Uzanu of South East Uneme, HRH Benjamin Ikani, listed other communities affected by the flood to include Uneme-Ekwuekpele, Uneme-Ogwoyo, Uneme-Ukpeku, Uneme-Ogbethaya, Uneme-Yeluwa and Uneme-Unubu. The Etsako East council boss, Mr Aremiyau Momoh, and his counterpart in Etsako Central, Mr John Akhigbe, said the disaster was beyond what the council areas could handle. According to them, IDP camps had been set up in strategic locations across the council areas. Akhigbe, who visited the affected communities in a boat, appealed to public spirited individuals to come the aid of the council. The lawmaker representing Etsako Central Constituency at the state House of Assembly, Hon Damian Lawani, relocated to the only resettlement Centre In Ekperi in Estako Central local government area. Lawani, who is from Udaba, noted that over 12,000 residents had been rendered homeless. He said that residents’ health was an issue of concern as corpses were washed out of graves by floodwater. According to him, many victims were taking shelter on trees and suspended platforms. But to mitigate the impact of the flooding, Edo State government intensified the distribution of relief materials to victims in affected local government areas. Meanwhile, as part of the response plan to the flooding, the state government has partnered the Economic Community of West Africa States (ECOWAS) Early Warning Mechanism for Nigeria (EWMN) to strengthen emergency management teams in local councils to mitigate the effect of the floods. The Special Adviser to the Governor on Special Duties, Mr. Yakubu Gowon, disclosed this during a road walk organised with ECOWAS-EWMN to raise awareness on the dangers of indiscriminate waste disposal and other unsafe environmental practices that lead to flooding and other environmental disasters. The sensitisation exercise was coordinated by the state government and ECOWAS-EWMN and involved a multi-agency delegation, including Edo State Emergency Management Agency, non-government organisations (NGOs) and security agencies. The team marched through Airport Road, King Square, Oba Market, Akpakpava, Agbado Market, Ikpoba-Hill Market, New Benin, Ekiosa Market, among others. They distributed flyers and sensitised the people on safe environmental practices in English, Yoruba, Igbo, Hausa, Benin, Etsako, Igbanke and Isoko languages. Gowon said his office will work with the ECOWAS team to fast track response and emergency services to local government, noting that the council chairmen will be supported with relief materials to minimize the effect of the floods. He noted that the response plan includes preemptive measures that will see the councils developing a workable template to forestall the devastating impact of the floods in future. “Each local government area must have a contingency plan in place while the state government will develop a state contingency plan. They will meet quarterly for review. We also agreed that emergency management is everyone’s business, as such all should work together as a team in tackling the challenges of flooding in the state”, Oke-Osanyintolu added.